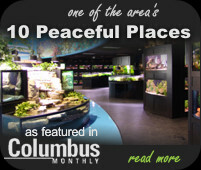 Aquarium Adventure carries the widest selection of aquariums, fish, corals & plants. 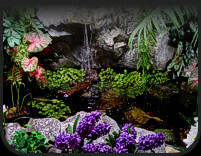 We offer everything from do-it-yourself pond equipment and starter sets to full custom installation packages. Our experts can answer those really tough questions about installing and maintaining garden ponds...a service the hardware stores cannot provide. Come visit our store and take a tour! The Southeast Asia River Environment includes the larger rivers of mainland Asia , as well as those in the Malay Achipelago. These waters are fast moving, very high in oxygen, and grow rich plant fauna. This niche is also a typical habitat for thin, fast moving, streamlined fish. Tan to light brown gravel mixed with white or tan sand is recommended to simulate the natural substrate. Large, round pebbles (which have been made smooth by the flowing water), driftwood, and plants should also be used to recreate this niche. A 20 gallon aquarium is recommended to recreate this particular niche (a smaller size could be used, but with fewer fish). Fill the tank with two (2) inches of water. If an under gravel filter is being used, put the filter plate in the bottom of the tank at this time. Rinse the substrate (gravel/sand) and add it to the aquarium. Note: If you are using an under gravel filter, add 1.5 to 2 pounds of gravel per gallon. If an under gravel filter is not being used, then add 1 to 1.5 pounds of sand per gallon. Once the substrate has been added, fill the tank half full of water. Next, add plants, driftwood, and pebbles to recreate your Southeast Asia River Environment. 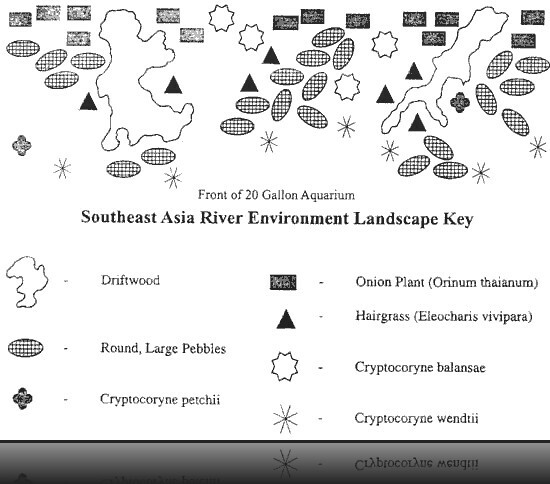 In this handout, there is a diagram on how to landscape this niche. Don’t forget to protect the roots of your plants as you anchor them into the substrate. A safe method is to gently ball the roots into your hand and make a loose fist. Using this fist, burrow a pit in the substrate and gently unfold your hand allowing the roots to spread out. Gently cover the roots with enough substrate to hold them down. Finish filling the tank with water. Place the heater in the tank, but do not turn it on a this time. Allow the heater glass to acclimate to the water temperature in the aquarium for one (1) hour before plugging it in. You can camouflage the heater behind the rocks. Equip the aquarium with a filter system. If using an under gravel filter, hook up the air pump or power head (water pump) to the uplift tubes. If using an internal filter, place it in the tank towards the back of the tank and hide the filter using rocks. If an outside filter is being used, place it on the outside back of the tank, or under the aquarium. Hide the siphon tube, which draws water from the tank to the filter, with tall plants or driftwood. Put the thermometer in place, and add water conditioner to the aquarium. Turn on the filtration system. After testing the pH and water hardness, necessary adjustments can be made by using proper aquarium chemicals to recreate the Southeast Asian River water conditions. Now, place the aquarium top in position and make any adjustments (cut outs in the back) to accommodate the heater, filter and cords. Turn on the heater and the light. A 10 –12 hour light cycle is highly recommended. Make any final adjustments to the heater in order to stabilize a temperature between 74-76 degrees. All newly set-up aquariums must go through a filter conditioning process in order to sustain fish life (see our “New Tank Water Conditions” tip sheet for further information). It will take the water approximately 4-6 weeks to condition, during which time only a small number of fish can be added to the tank. Once the aquarium has been set up and running for a minimum of 24 hours, six (6) 1.5 inch fish per 10 gallons of water can be safely introduced. For this particular niche type Giant Danios, Black Ruby Barbs, and Rainbow Sharks would be good choices to start. Over the next several weeks, when water quality of ammonia and nitrite reach zero, more fish can be added. Feeding the fish will vary depending upon the age of the aquarium. Early on, during the first 4-8 weeks, the fish should be fed a small pinch of food (about the size of a dime) once every other day. As the aquarium ages and conditions (2-4 months of age), fish can be fed once a day. When the tank is over 4 months old, the fish can be fed several times a day, but use small quantities of food at each feeding. Partial water changes are the single most important procedure you perform on your aquarium. Remove 20% of the water every two (2) weeks, and replace it with fresh water that has been treated with a water conditioning chemical. Clean unsightly algae using an algae pad or a magnetic algae remover when necessary. Keep in mind, that some algae left in the tank can be beneficial as it provides a food source for certain fish. Algae also creates oxygen for the aquarium environment.